Earlier this week, I wrote a blog post about the first Christmas Appeal received this year. It’s the only one received so far, which suggests others may still be navigating the many tasks they need to complete in order to drop their Christmas Appeal. As part of those tasks, it’s not too late for non-profits to conduct data hygiene! Assuming some charitable organisations are behind with their Christmas appeal, perhaps the reason is data hygiene. One of the single most important steps prior to the Christmas appeal drop is the need to complete hygiene. Some non-profit organisations take the important step to cleanse their data, while others do not. Those non-profit organisations who perform data hygiene, perform this task at least one time per year. As suggested in prior FundraisingForce blog posts, dirty data gets you nowhere…except broke. Proper data cleaning prior to dropping the all-important tax and Christmas appeals is not optional. Do you put this in the “too hard” basket? Hire an expert like FundraisingForce who will guide you through the process, management of suppliers, and develop a process for you to follow for years to come. If any of you have heard me present at conferences or you have hired me as a consultant, you will have heard me preach “CEE” every record. No, that is not a typo. I do not mean to “SEE” every record. I truly do mean you should CEE each and every record. Confirm contact details each and every opportunity you have for contact with a supporter – whether on the telephone, via Email or in person. Take the extra step and ask the supporter whether they still live at the address contained in your supporter relationship management (SRM) database. Chances are, if they are like millions of other Australians, they moved in the last 12 – 18 months. Edit the contact details, which are erroneous in your database. Be sure to maintain a record of the old contact details with an end date. And, add the new contact details with a start date. Enhance details missing. Take a moment and ask the supporter for things like an Email address, mobile phone number, or date of birth. 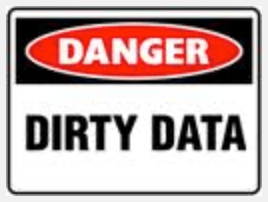 Educate staff so they understand data cleanliness and accuracy is not someone else’s job. Staff often believes someone else takes care of record cleanliness and this thinking, in my opinion is insane. I ask – how can someone else be in charge of records? ; when do you believe that someone else is going to take the time to clean the record? ; and, how is that information getting passed along? Staff needs to learn there is no time like the present and, in fact, while they have possession of the record, they are responsible for the record. Waiting to change a record often means staff forget all the things learned about the donor. Do it now. Training staff how to perform these tasks, correctly. Staff often times fear doing something wrong, so they would rather send a note to someone else to make the changes required. The buck stops with you. Train everyone how to create new records and to edit and enhance existing records. Distribute written procedures to ensure people have reference materials after the training. Monitor your team to ensure procedures are followed. Coach those who miss steps, perform tasks incorrectly, or do not follow the procedures. Offer rewards to team members who perform the tasks with 100% accuracy. When the next call comes in, be sure to CEE the supporter’s record. And, let others hear you. Staff likes to follow a manager’s lead. Set an example for the staff to follow. When staff CEE various records throughout a day, staff perform the first step in good data hygiene. Watch this blog for other important components of data hygiene as well as tips and tricks about good database maintenance. What’s in a Name? – A Response! I would probably never wear a tuxedo to a BBQ or pool party. Nor would I wear a singlet and board shorts to a gala dinner. I am hopeful most of us know the appropriate attire for the different events and occasions we attend. In a similar fashion, we use different language and words in different settings and with different people. Do we speak the same in front of close friends and family versus someone we have never met? The setting and sometimes the communication method dictate our words. We might use different language in a written card or letter than we would in an email. And a text message or tweet would probably use even different words. When we communicate with our prospects and donors do we change the way we salute and address them depending on the occasion for communicating with them? If we’re sending them an invite to our awards dinner, does their name appear the same as on their donation thank you? Is it the same as our invite to our summer sausage sizzle? The name you use for your prospects and donors is important for relationship building. Using the correct Addressee and Salutation could affect whether you get a response from them. For example, I have a friend named Patricia. She only goes by Patricia. She is never called Pat or Patty. If any organisation approaches her using either of the latter, she will not respond. Your organisation should record the preferred, standard way a constituent wishes to be addressed and saluted. However, your organisation should also consider recording additional addressees and salutations for each of the ways in which you may communicate with them. Family/Household – Used to address additional members of the person’s family such as their partner/spouse and their children. It can include the names of each person or simply be something like “The <Surname> Family”. This option is great to invite the entire family to school functions or for a holiday card. Recognition Name – Used for when you post or publish a list of donors or other type of recognition. For example, in your annual report an individual donor might want their partner/spouse also listed with them even though the donation came only from him/her. Once you have recorded these Addressees and Salutations, you will be able to communicate with a majority of your constituents in way that builds a connection and relationship with them. Again, think of my friend, Patricia, and your own communications with people. So please salute me as Mr. Bernstein, Daniel or Dan depending on the occasion and method of communication. However, one final tip, please don’t mix addressees and salutations on the same piece or I might show up to your event in a tuxedo with board shorts and thongs.